As American culture continues to embrace the Foodie movement, more restaurants are choosing to elevate their atmosphere for a more multidimensional dining experience. The modern diner is looking for an enjoyable environment, and often prefers an outside dining option when the weather is nice. Whether it is a first date, a Friday happy hour or Sunday brunch with the family, dining outdoors is a desirable and fun experience. For this reason, restaurateurs are finding new and interesting ways to incorporate exterior dining options into their restaurant. The following are the top 10 trends for outdoor restaurant dining we have observed in North America. If you are looking to add or remodel an outdoor space at your restaurant, the key to success is finding the right atmosphere for your brand as well as your particular climate. In many cases, seasonality and climate will limit how often your clientele will be able to dine out of doors. No matter which type of dining area you establish, adding in a series of commercial-grade outdoor patio heaters is a worthwhile expense that will extend your patio dining areas usability into the chillier months and evenings. Alongside the Gastro-Pub movement, we have observed a rise in the fun and fabulous beer garden. These dining / drinking gardens are typically an inexpensive, casual addition featuring picnic tables, large patio umbrellas, and garden accents such as hanging plants and cheerful flowerbeds. Add in fun international accents such as beer steins and foreign signage, and you are most certainly going to attract lucrative, repeat visitors especially during happy hour and the weekend. A swanky outdoor lounge is the perfect complement to an up-market restaurant. Create an atmosphere of urban sophistication with comfortable, luxurious furniture as well as en pointe aesthetics. If you are a design novice, it is worth hiring a professional designer as nothing destroys the lounge mystique faster than amateur design. These types of lounges are a perfect pairing with ultra sophisticated cuisine, small plates or tapas. The sidewalk café mimics the common street dining found in France, Italy and Switzerland. The set up can be executed in two simple ways. The first is small café tables with plenty of garden patio umbrellas to provide shade. The second is pairing small café tables with a spacious awning. Red and red stripped awnings that feature the restaurant's name are a particularly charming and authentic. If your target demographic is twenty-something’s, consider a slightly more urban-meets-antique aesthetic. Eclectic furniture pieces, a graffiti-art mural and wi-fi access will attract hipster clients in droves. Make sure tables have space for both food and laptops. Not so much a new trend, but certainly a powerful one. If your restaurant is located in beautiful locale – be it desert, mountain or waterfront scenery – consider creating a patio that allows for broad panoramic views. In some instances this will require an elevated dining area. This investment, however, will almost certainly pay for itself as gorgeous views are in high demand and word-of-mouth referrals are virtually guaranteed. There are currently two predominant versions of the courtyard experience – the English and the French provincial. The English approach is a bit more formal and manicured and will require more rigorous garden upkeep as well as more formal dishware. The French provincial approach is a bit more casual… think dressed-up wooden picnic tables and authentically rustic - even mismatched - tableware. It should feel as though you were having a relaxed lunch at a winery in the south of France. Whether English or French in nature, the courtyard experience is all about pairing exquisite gardens with refined, continental touches, for an charming and intimate dining experience. The rooftop party mimics the highly sought after NYC rooftop space. These dining areas tend to be relaxed and often transition into a more bar-type atmosphere as the night progresses. Add in colorful lanterns, sparkling lights, and modern urban accents. A rooftop dining area is a fabulous addition to laid back, casual restaurants. Safety can be an issue, so invest in proper railing and consult a lawyer about mitigating possible liabilities. Many restaurants are placing a greater emphasis on using organic, local produce... and some are even growing a portion of their own produce on site, including vegetables, fruit and even poultry. The farm patio experience seeks to extend the dining room into the garden area, so the diner is truly immersed into the locally-grown experience. Unfortunately, with nature also comes the elements and it’s not fun to dine where it’s muggy and buggy... so these restaurants must vigilantly police the area for critters and flies using non-toxic methods inline with their organic branding. There has been a conspicuous increase in convertible patios - indoor dining spaces that can transform into patios by removing walls or portions of the roof. Many restaurants have installed garage doors and electric awnings so that entire walls can open up on more beautiful days. This tends to be more appropriate for casual dining destinations, but – with the right architect / contractor and sliding glass walls - can also work for a more sophisticated experience. Southern cooking and comfort food are definitely on trend in the US right now… and many restaurants are extending the experience beyond the dish to the restaurant's atmosphere. Wrap around porches with southern charm are becoming very popular in the comfort food circle. 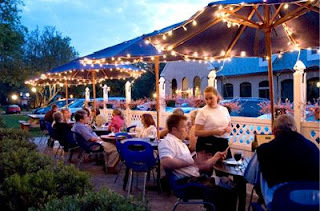 Think flower boxes, pickle jars and large overhead fans that transport the restaurant-goers to a gentile Southern home. About the Author: Derrick Riley is a Managing Partner at Patio Products USA, an online commercial and residential patio products store. Patio Products USA is one North America’s largest distributors of patio furniture covers, patio fire pits on sale and garden patio heaters.